The Soyuz spaceship "Gagarin" approaches the International Space Station for docking on April 6, 2011. This story was updated at 11:26 p.m. EDT. A Russian spaceship bearing the name of history's most famous cosmonaut docked at the International Space Station late Wednesday (April 6) to deliver three new crewmembers to the orbiting lab. The Soyuz TMA-21 — nicknamed "Gagarin" after Yuri Gagarin, who became the first person in space on April 12, 1961 — successfully docked with the station's Poisk module at 7:09 p.m. EDT (2309 GMT). The spacecraft had launched from Baikonur Cosmodrome in Kazakhstan on April 4, blasting off from the same pad used for Gagarin's historic flight nearly 50 years ago. 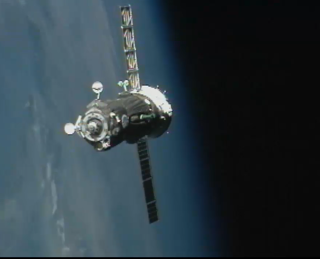 "Contact and capture — docking confirmed," a NASA official announced as the "Gagarin" sidled up to the orbiting lab. The "Gagarin" launched into space Monday (April 4 EDT) carrying two cosmonauts and one NASA astronaut to join three other crewmembers already aboard the station, rounding out the orbiting lab's Expedition 27. The three spaceflyers — NASA's Ron Garan and Russians Alexander Samokutyaev and Andrey Borisenko — will also stay on as part of the next station mission, Expedition 28. "It was a great couple of days and we're ready to get to work," Garan said. The crew received a flood of congratulatory calls from Russia's Mission Control center near Moscow after docking at the space station. Russian space official and the families of the astronaut and cosmonauts were on hand to wish the crew well. "We love you," Garan's wife Carmel told her husband and his crewmates after their arrival on the station. "We'll keep the fires burning at home, and we'll welcome you home with open arms at the end of your successful mission." The International Space Station seen from the Soyuz "Gagarin," as the spaceship approaches for docking on April 6, 2011. All three spaceflyers — and the "Gagarin" — will stay at the space station until September, when they'll come back down to Earth. They'll therefore be aboard the orbiting lab for a series of big spaceflight anniversaries and milestones. There's the 50th anniversary of Gagarin's flight and the 30th anniversary of the first space shuttle flight. Both of those events occurred on April 12 - Gagarin's mission in 1961 and the shuttle fleet's first launch 20 years later, in 1981. The three new crewmembers will also be aloft for the 50th anniversary of the first American in space — Alan Shepard's flight of May 5, 1961. They'll also bid farewell to NASA's space shuttle program from the orbiting lab. The space agency is retiring the workhorse vehicles later this year after three decades of service. The last two shuttle flights — Endeavour's STS-134 mission and Atlantis' STS-135 flight — are slated to launch toward the station in April and June, respectively. The three crewmembers already aboard the station — cosmonaut Dmitry Kondratyev, NASA astronaut Cady Coleman and European spaceflyer Paolo Nespoli — have been there since December. They're scheduled to return to Earth next month. Gagarin launched in a spherical Vostok 1 capsule, orbited Earth once, then landed safely in a Russian field 108 minutes later.